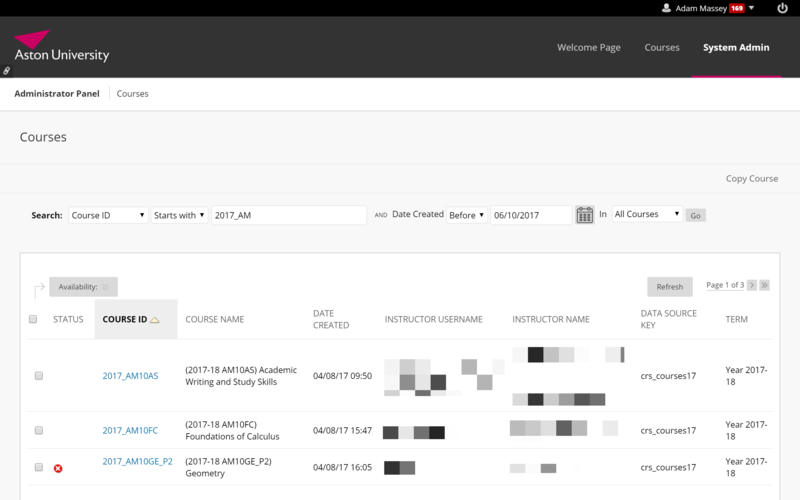 Blackboard courses created by SITS are attached to Blackboard’s Institutional Hierarchy. This allows school administrators to have access to all of their school’s taught modules on Blackboard, view content within, and quickly enrol themselves if they need to (eg to create assignments, post announcements etc). Add this page to your browser’s bookmarks for quick access. Course ID – For taught modules this is the academic year, then an underscore, then the module code. Course Name – Contains the year, module code, and module title. Your results are displayed underneath the search options. in the Status column shows that a course isn’t available to students. You can sort the list by clicking on the column headings. If you require access to a module and you can’t find it, email blackboard@aston.ac.uk. Having found the course and clicked on the course ID, you may need to enrol onto it (eg to create a Turnitin assignment), post an announcement, etc. You don’t need to quick enrol yourself onto every course in one go, eg at the start of term. Quick enrol on a course only when you need access to it. You may see an error message, or one saying there are no available items in the course. Ignore the misleading Log In button. button located at the bottom of the course menu. When you agree to the confirmation, you will be enrolled on the course as an instructor. When enrolled on the course, you will receive announcements sent as emails by the instructor(s). You can create a rule in Outlook to reduce the noise – either move them to a folder (so you can scan through them at a later date), or automatically mark them as read. Search the Course Name for something that Contains the name of the module. Then click on the Status heading on the table of results  so that it displays the results in ascending order.